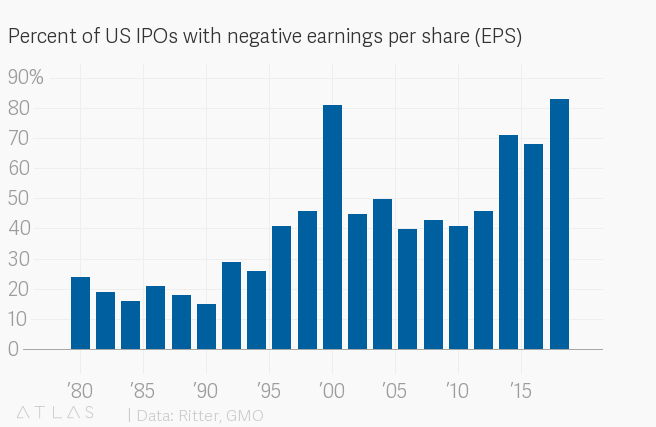 Tech companies these days tend not to be profitable. But this infamous line is nowhere to be found in Zoom’s S-1 filing, which was made public today (March 22) ahead of the company’s listing on a public exchange. The billion-dollar company has already eked out $7.5 million in profits in 2019, after losing $3.8 million in 2018 and pretty much breaking even the year before, only losing $14,000. The company, which sells video-conferencing software, credits its success to “viral enthusiasm,” a term that has not been used in any S-1 filing dating back to 1991, according to Sentieo. Zoom uses the term eight times, and it’s generally explained as people being extremely stoked that their video conferencing product actually allows them to video conference. “Viral enthusiasm begins with our users as they experience our platform—it just works,” the company says in its S-1 filing. Video conferencing that actually works probably deserves to be a billion-dollar business. As Quartz has covered extensively, video conferencing is a messy, annoying technology that typically does not work until 10 minutes after your meeting was supposed to start. The problem often has to do with software and hardware incompatibility, as well as the burden of compressing and sending high-quality video over all kinds of different networks. Zoom says that its solution is different because instead of adding video to a traditional conference call, it’s new enough to have focused on building video conferencing from the beginning. The company brags in its S-1 about how its software functions differently than its competitors, and how its cloud infrastructure makes the process more seamless. The company also has room to grow as remote work becomes more prevalent. In the filing, Zoom reported that more than 50% of Fortune 500 companies pay for at least one Zoom account, meaning there’s still headroom, even though the company has a foothold in the market. Zoom will trade under the ticket ZM and is looking to raise about $100 million, according to CNBC. Correction: An earlier version of this article referred to Zoom “hardware,” which Zoom does not make.